Following Dubai, Cairo, Manama, and many more Arab cities, MIT Enterprise Forum Pan Arab is finally coming to Beirut! ?? 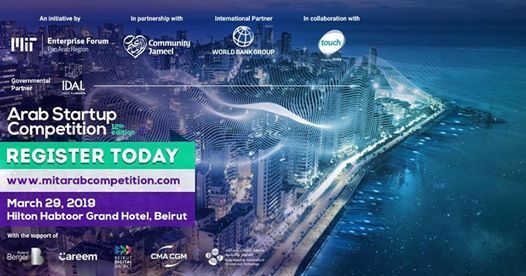 Action leaders, opinion makers, industry experts, strategic decision makers, will all come to Beirut to debate the latest in tech, innovation, and investment. In recent years, Lebanon's startup ecosystem has grown to become an emerging hub of innovation and technology, where innovators and entrepreneurs can set up shop, test their ideas, and take their enterprises to the next level. 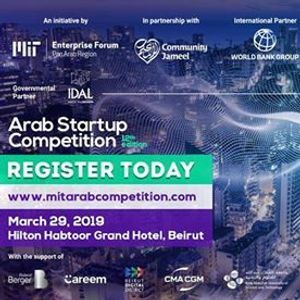 Join us on Friday, March 29, 2019, starting 2:00 pm at the Hilton Beirut Habtoor Grand, Beirut, for a conference and award ceremony of the 12th edition of Arab Startup Competition. After selecting 67 semifinalists from the Arab Region, these teams will undergo 2 rounds of judging that will determine who will be the grand prize winners for this year, reaching a sum of $160,000! The event will be concluded with a networking reception. Please make sure you register for the event and to have your ticket/QR code present upon check-in. MIT Enterprise Forum Arab Startup Competition (ASC) is a yearly competition initiated by the MIT Enterprise Forum Pan Arab since 2006. This annual competition is designed to empower entrepreneurs and foster an eco-system of innovation and entrepreneurship in the Arab Region. ASC pits entrepreneurs in three different tracks: Ideas, Startups and Social Entrepreneurship Track. The winning teams are awarded 160K USD in equity free fund and benefit from a range of other activities including top tier trainings, mentorship, coaching, media exposure and great networking opportunities.